1. The way that Tokyo is so hectic, yet so organised, friendly and polite that you feel peaceful in the middle of the chaos. 2. 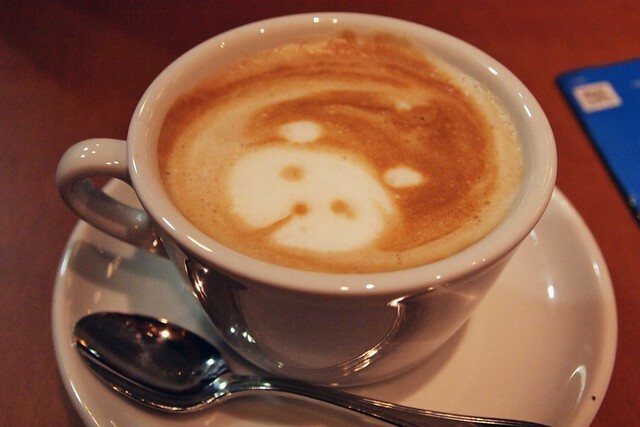 A country with a love of all things kawaii, from panda coffee to smiley face cookies. 4. Cat cafes. Need I say more? 6. THE FOOD. From high-end world cuisine to handmade tofu and shojin ryori feasts, Japan does mouthwatering eats like nowhere else. I was worried about being a vegetarian in the land of sushi, but the sheer range and quality available in Japan would satisfy anyone’s tastes. 7. The beautiful deer of Nara. Japan’s old capital city is now home to around 1,200 deer and some of the most beautiful temples and scenery in the country. 8. Catching a glimpse of some maiko running errands, and remembering how Japan is the perfect combination of ancient and new. 9. The changing seasons, from sakura blossom time in May to the colours of autumn in Kyoto’s forests. Even the rain is pretty! 12. Blue Hour, the magical twilight that bathes Tokyo every evening as the lanterns come on, people leave work and the street food stalls open up. This post is a competition entry to win a blogger trip to Japan – keep your fingers crossed for me! Japan is totally up there on my travel list – and for many of the same reasons as you. I found out about the cat cafes recently from the Katy Perry film and ended up Googling them when I got home! I so want to go to Japan! We were all booked and due to visit on our way back to London after visiting my homeland of New Zealand. Unfortunately 5 days before we were due to fly in there was the Tsunami. We had an earthquake in NZ and narrowly missed the Tsunami. Sad times. I hope to get there sometime soon. P.S. Hope you win! So so incredibly kawaii. I’m so glad you went to a cat cafe. Was it soothing and comforting or just kind of creepy? I wanna go there right now!! Best of luck! Hope you win the trip! Japan is often overlooked as a tourist destination – go figure! Kyoto is first in my to-see list.